Professor Monro is a physicist and photonics researcher who is currently ARC Georgina Sweet Laureate Fellow and Deputy Vice Chancellor Research & Innovation at the University of South Australia, where she has been since November 2014. Prior to this she was the inargual Director of the Institute for Photonics & Advanced Sensing (IPAS) and the ARC Centre of Exellence in Nanoscale Biophotonics at the University of Adelaide. Professor Monro came to the University of Adelaide in early 2005 as the inaugural Chair of Photonics. Tanya is a Fellow of the Australian Academy of Science (AAS), Vice President of the Australian Academy of Technological Sciences and Engineering (ATSE) and Fellow of the Optical Society of America and the Australian Institute of Physics. She is a member of the Prime Minister’s Commonwealth Science Council (CSC), the AAS National Committee for Physics, South Australian Economic Development Board, where she chairs the Science, Innovation and Commercialisation subcommittee and a member of South Australia’s Riverbank Authority. She is a member of the SA Premier’s Science & Industry Council, and is Chair of the Council of the National Youth Science Forum (NYSF). Tanya is also an inaugural Bragg Fellow of the Royal Institution of Australia (RiAus). In 2014 Tanya was awarded the Beattie Steel Medal of the Australian Optical Society and in 2012 the Australian Academy of Sciences’ Pawsey Medal. 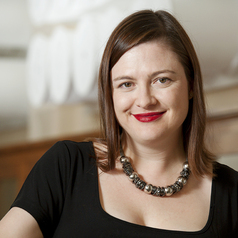 In 2011 Tanya was named South Australia’s “Australian of the Year” and the Scopus Young Researcher of the Year. In 2010 she became South Australian Scientist of the Year and Telstra Business Women of the Year (in the Community & Government category). In 2008 she won the Prime Minister’s Malcolm McIntosh Prize for Physical Scientist of the Year. Tanya obtained her PhD in physics in 1998 from The University of Sydney, for which she was awarded the Bragg Gold Medal for the best Physics PhD in Australia. In 2000, she received a Royal Society University Research Fellowship at the Optoelectronics Research Centre at the University of Southampton in the UK. Tanya Monro has published over 500 papers in journals and refereed conference proceedings.